Scrape no more, car enthusiasts! Here is a guide and mental map of where you can park your sweet whip without the anxiety of bottoming out. n lowered cars, a test car provided by Zestino Online has been used to test out the best and worst points of where to park your car. 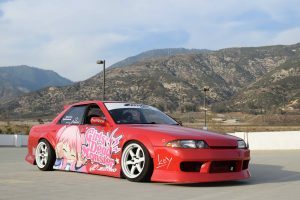 The test car is an ’89 Nissan Skyline drift car. It is set up for track use, but can also be used to drive daily. 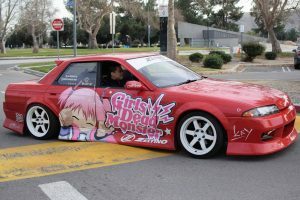 On top of being lowered, it also has a body kit, which leaves the car with a grand total of 2 inches of clearance in the front, 3 inches from the side, and 7 inches in the rear between the body kit and the ground. I had to angle every dip and speed bump that I have seen. It is to lessen the risk of scrapage because instead of the wheels moving over a bump two wheels at a time, each single wheel passing over gives it a more even approach. The way each driveway will be rated is going to be judged on a scale of easy, medium, and hard. Easy means as it sounds: easy entry along with a slight necessity of angling your car. Medium means that it is doable, but might take some time. And hard means that it will take a lot of time and effort to get your car across that driveway and is totally not recommended, but you can certainly try based on the knowledge of your personal car clearance. For the most part, this campus is lowered car friendly. Although some of the roads have dips and speed bumps, the majority are speed bump free. Parking lots G and H fall under the medium difficulty category. The entry has a small dip, but the difficulty comes from the long speed bumps. Although it is doable, there are better places to find parking if this lot has high density traffic coming through. One of the most difficult lots to enter would be the main entrance. Although it is dip-less, drivers are greeted with two long speed bumps down the middle, and then encounter even higher speed bumps. Due to the high traffic nature of this entry, I do not recommend these lots to find parking. Another hard difficulty entry is parking lot L. The east entrance for this structure is fine, but the west entrance gave me some trouble. This is because a small dip into an uneven ledge can cause extreme scraping. So much so, that the car actually got stuck like a beached whale. So in short, if you do not want to damage your front bumper, avoid the west entrance to parking lot L.
Student Riley Layos provides useful information “Most lowered cars just park in the structure to be honest” he continues, “the Skyline would get f***ed up where ever yellow speed bumps are around school.” I couldn’t agree more. So if you see a yellow speed bump, consider it a warning sign. The best way into the parking structures is to take Northpark Blvd. eastward, and then make a left into Campus Circle. I can guarantee that the cringe when hearing the bottom of your car scrape is real, even to non-car enthusiasts. Hopefully, this guide will help prevent new students from damaging their cars on their way towards their class with peace of mind. You got my attention when you said that there are parking roads that have dips and speed bumps, so it’s best to find a parking lot that’s car-friendly. My husband and I always struggle to find a parking space for our car when we go to places that have no parking lots. We want our car to be always safe from damages, so we’ll consider finding a parking app that can help us find good and safe parking areas.